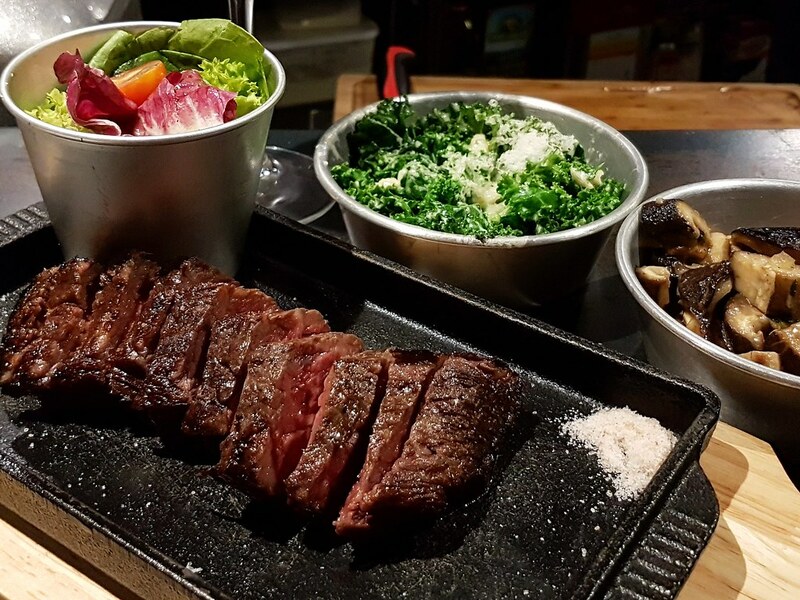 A hidden gem situated within Serene Centre is Fat Belly, the new casual speakeasy steakhouse that opened months ago, co-sharing the same space with its sister brand and ice cream parlour, Sugarhaus. Helmed by banker-turned-food entrepreneur Stanley Seow, Sugarhaus runs the daytime business with its extensive brunch and desserts menu, while Fat Belly takes over for dinner from 6 to 10pm every night with its 10-seater countertop dining area at the back of Sugarhaus. Although both eateries possess separate menu, we had the opportunity to try the dishes from both Fat Belly and Sugarhaus that night. The former focuses on specialty rather than variety with its straightforward and simple menu that offers only three alternative cuts of steak - Flat Iron, Short Rib and Denver Steak that boast stronger and more robust flavours, as well as a few sides and plated desserts to choose from. The latest menu addition at Fat Belly – The Wagyu Marble Score 7-9 Denver Steak ($48) features a lesser-known premium cut from underneath the shoulder blade bone. Done medium rare, the slices are slightly charred on the outside while the meat is tender, juicy, well-marbled and packed full of rich, beefy goodness. Served with a house salad, chimichurri sauce and Himalayan pink salt to further enhance its flavours, yet the well-seasoned denver steak has already sufficed as an enjoyment on its own. Add on an additional $5 for a side dish to complement your steak. Of the four available, we went for the Creamed Kale ($5) which comes in a bowl of vegetables doused in a pool of rich and luscious white cream and shredded cheese atop. 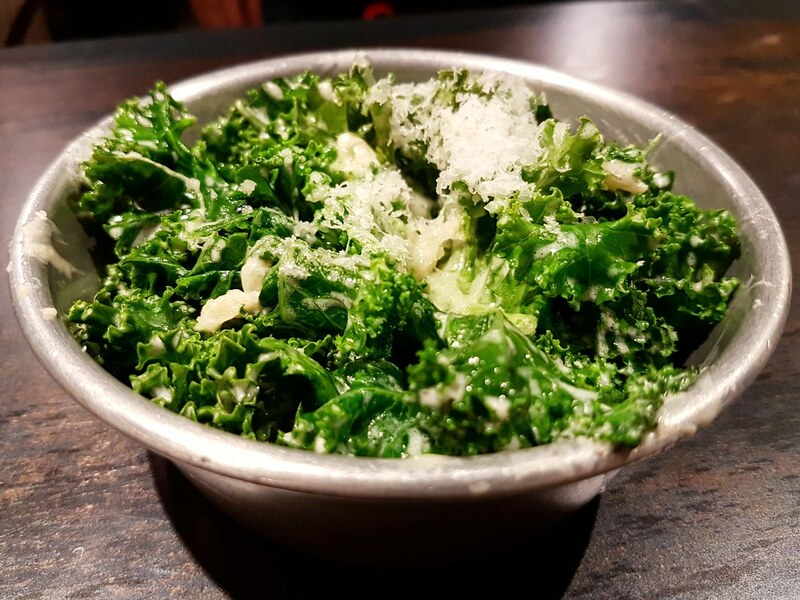 Despite the generous amount of cream used, the dish is non-cloying and the kale retains a nice crunch, while the cream elevated its flavour and makes the vegetable rather satisfying to chew on. 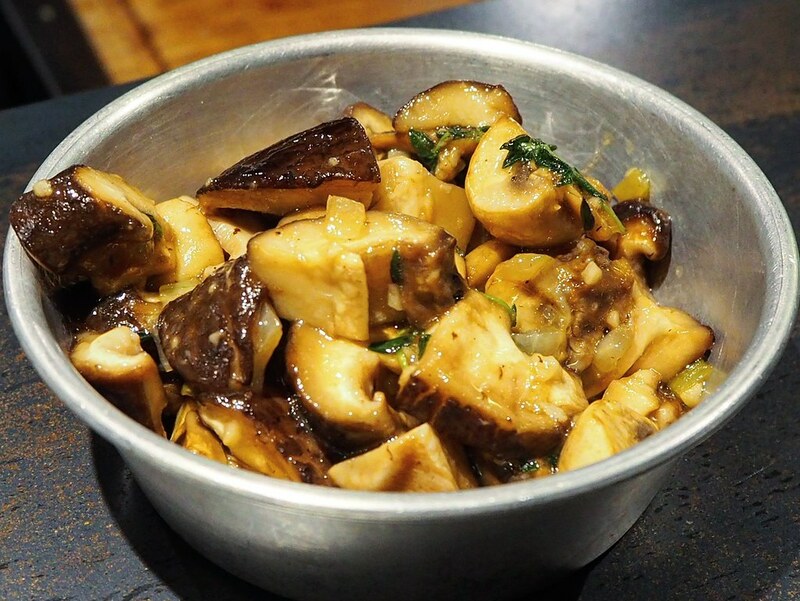 Another side dish available - the Sauteed Thyme Mushroom ($5) features a bowl of creamy and juicy mushrooms, slightly salted with a subtle thyme fragrance. Fat Belly also features a small selection of plated desserts. 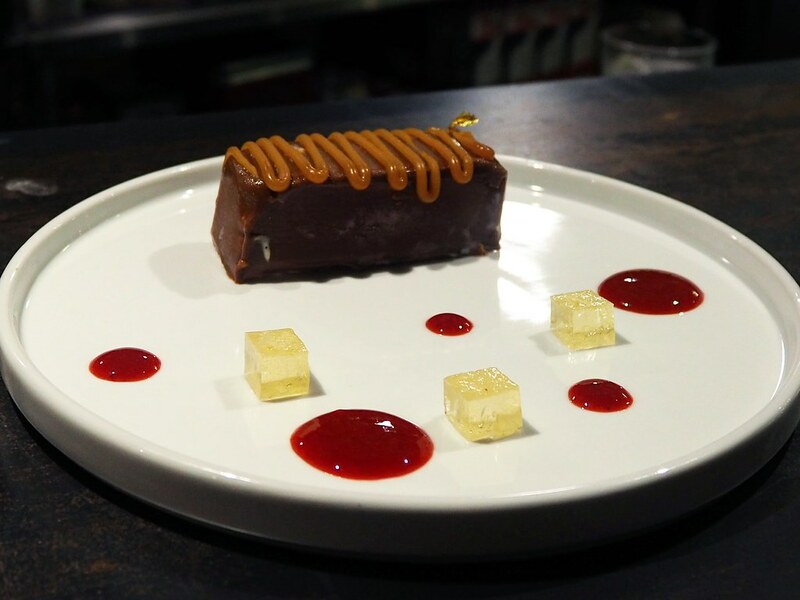 We had the Foie Gras Chocolate Bar ($12). Upon breaking the thin chocolate shell, the foie gras filling within comes in the form of ice cream. Taste-wise it reminds me more of a caramel-chocolate dessert, due to the lacking foie gras flavour which is too mild to detect. From the Sugarhaus menu, we had the Corn & Zucchini Fritters ($15) which comes in golden brown fritters, crispy on the outside with a soft and mushy filling, sunny side up egg, bacon, a generous drizzle of okonomiyaki sauce, kewpie mayo and garnished with bonito flakes. 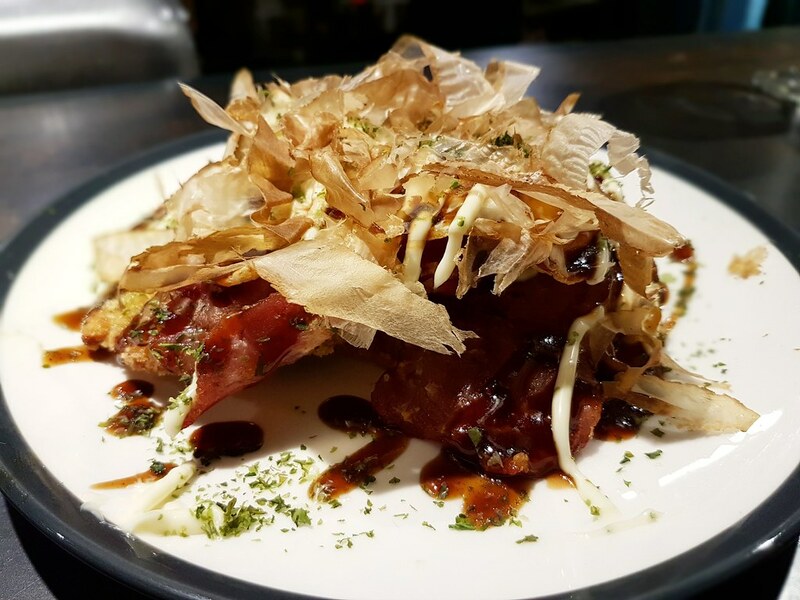 Similar to a Japanese okonomiyaki but this rendition fares notches higher with its medley of ingredients contributing to a pleasant interplay of flavours and textures. 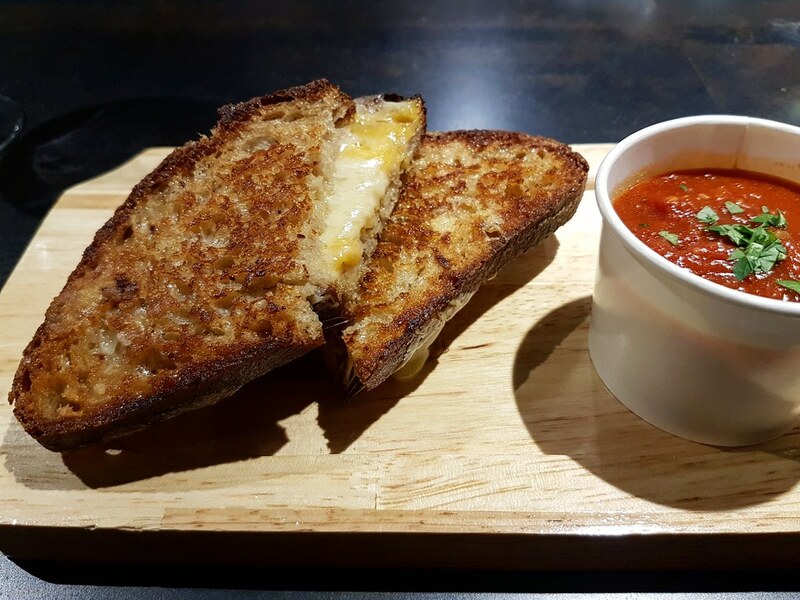 The Melted Cheese Toastie ($12) features a sandwich perfectly toasted and crisp on the outside, and stuffed full with Gruyere, cheddar and mozzarella cheese in between. Dip into the accompanying bowl of tomato soup for guaranteed satisfaction as it further accentuates the flavour of the melted cheese toastie. 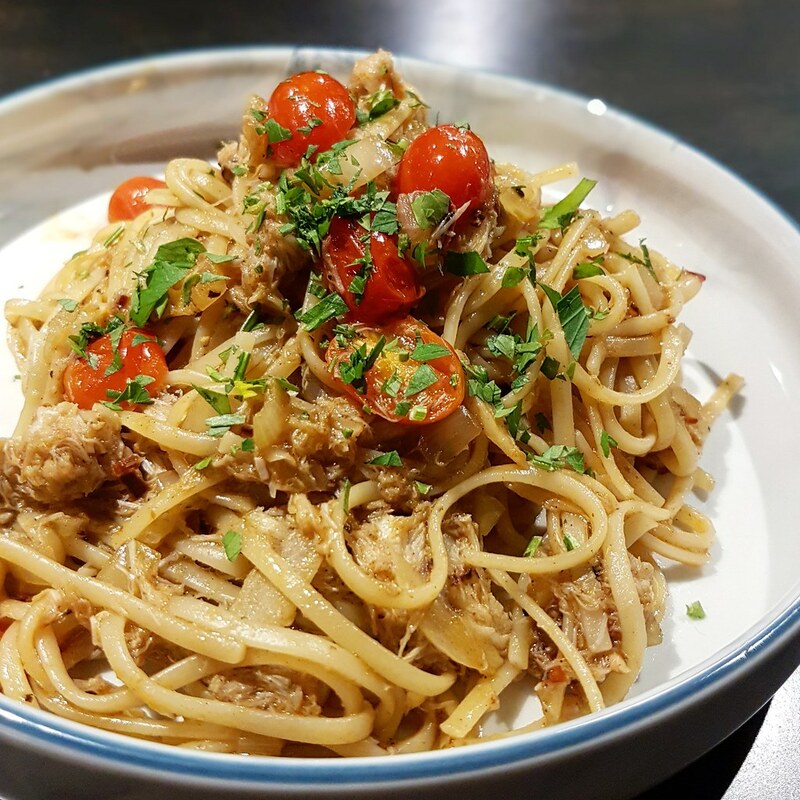 The Crab Linguine ($22) features al dente linguine noodles with a subtle sweetness due to the generous amounts of soft shredded blue swimmer crab claw meat embedded within. It is further tossed in their house blended spices, supplementing a strong spice fragrance to the crab linguine that just elevated the entire taste of the dish. 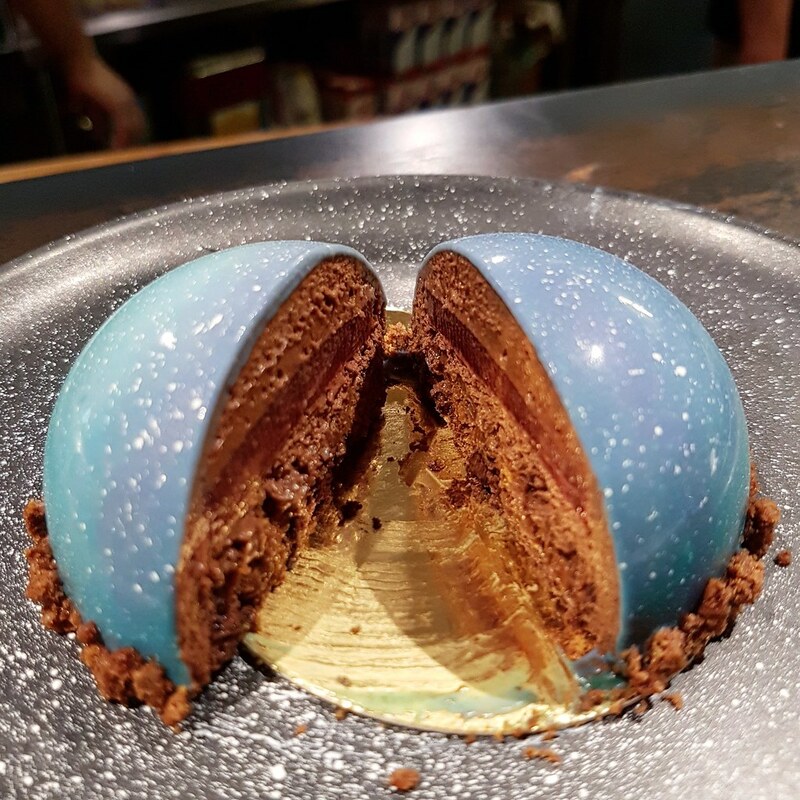 Round off the meal with desserts from the Sugarhaus's menu, such as The Galaxy ($8) which comes in a gorgeous galaxy-glazed dome. Breaking it apart reveals a rich chocolate mousse tart with crunchy bits within the ganache and a raspberry jelly center. The pastry boasts a rich, sweet chocolatey flavour with a hint of sourness from the raspberry that I really enjoyed. 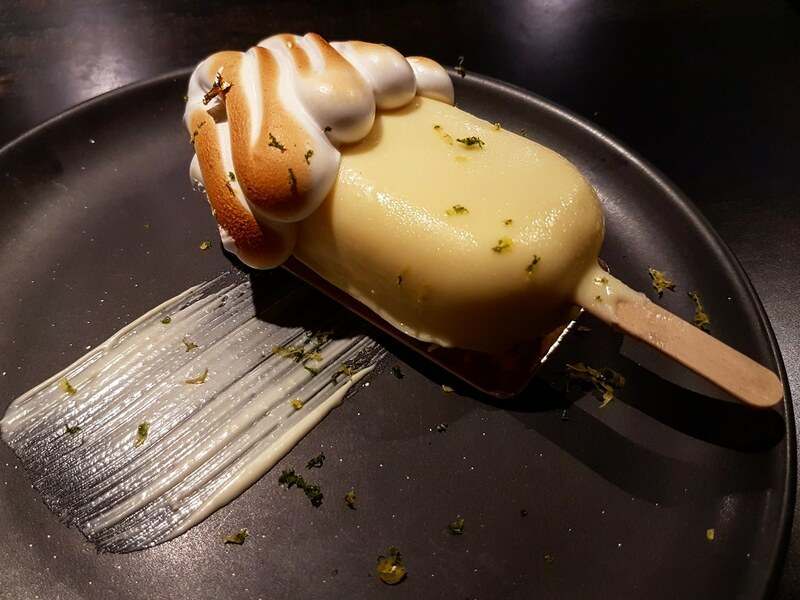 The Lemon Popsicle Tart ($8) comes beautifully plated with a lemon sable, parfait and meringue. Tastewise, it is not overwhelmingly sourish and boasts a subtle lemon fragrance. 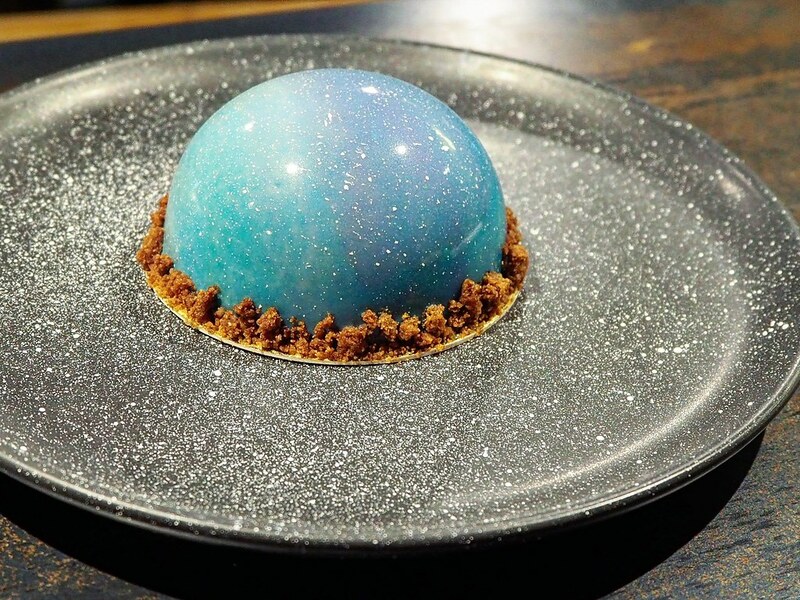 A truly unique dessert that fares well in terms of visual and taste. 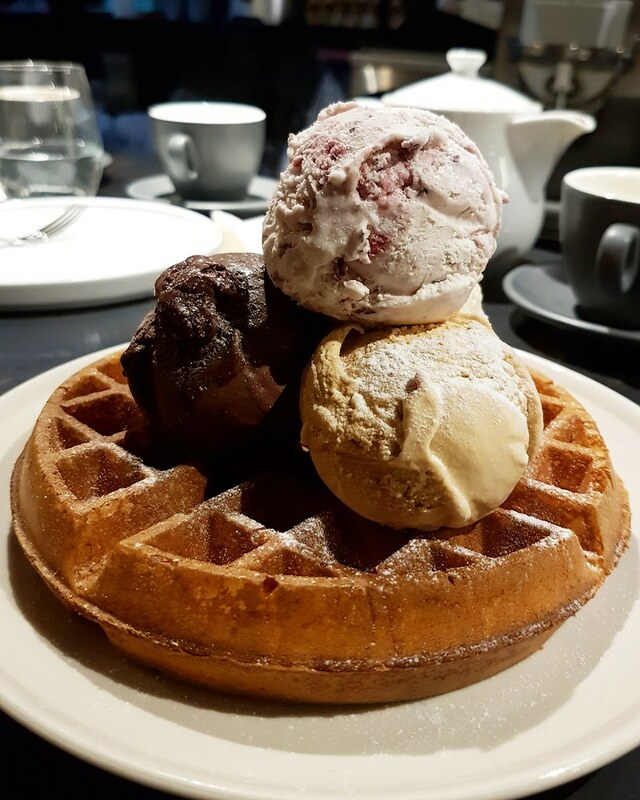 The classic waffle-ice cream pairing never goes wrong, and the ones at Sugarhaus hold out its own even against the uniquely plated desserts. Waffle with single scoop ($9.50) and extra scoop at $2.50 each. We had the waffles with Dutch Chocolate, Strawberry Cheesecake and Sea Salt Toffee. The waffle boasts an airy light crispiness on the outside with a fluffy interior, while the ice cream is rich and creamy, with each faring strong in its distinct flavour profile. Strategically housed within the same space, Fat Belly x Sugarhaus provide for a convenient one-stop to satisfy both your steak and desserts cravings. 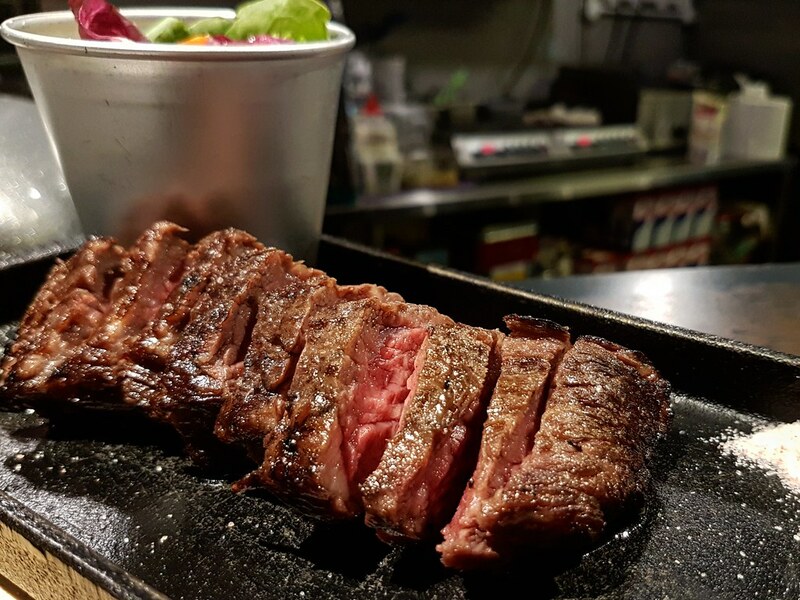 With such indulgent quality and affordable steak, we recommend coming in between 6 to 10pm to taste the menu from both eateries and get the best of both worlds while you're there.